For complete details, visit the "Events" page. 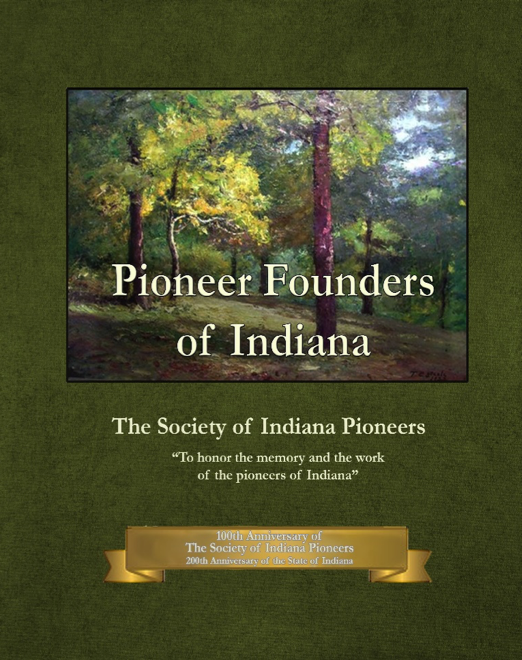 To honor the centennial of The Society of Indiana Pioneers and the bicentennial of the State of Indiana, the Society is offering this publication. The Pioneer Founders of Indiana book project is the culmination of five years of soliciting biographical sketches of pioneers from all 92 counties across Indiana. This is a Legacy Project endorsed by the Indiana Bicentennial Commission. Order your copy today. Proceeds go to The Society of Indiana Pioneers. The book order form is available here. To honor the bicentennial of Indiana and centennial of The Society of Indiana Pioneers, the Society sponsored the publication of a “lost historical novel” by a former leader of the Society. Attorney and historian Emsley W. Johnson, Sr. was Society president from 1940 to 1946. This intriguing story draws on experiences of his ancestors and relates challenges and triumphs of settlers between 1811 and 1861. To learn more, visit the "Store" page or download an order form here. The Society of Indiana Pioneers John H. Holliday Junior Award was established by The Society of Indiana Pioneers in 1970 to honor Mr. Holliday, the founding President. The award is given annually to a school club or class or similar organization. To be considered for the $500.00 cash award, groups must complete an application form describing a project, program or activity related to early Indiana history planned for the upcoming school year. For more information, visit our "Junior Award" page. Learn About the Society With Our Video! Our thirteen-minute long video tells the story of the Society of Indiana Pioneers, including detailed information about our major goals and projects. You can watch the entire video here, and segments also appear on this site's pages where appropriate. All of the videos are available on our new "Video" page as well. We hope you enjoy this video look at the Society's past, present and future! In 1915, the Indiana General Assembly created the Indiana Historical Commission which led the planning, preparation and conduct of the celebration of Indiana's Centennial. Local Centennial committees were organized throughout Indiana. John Hampden Holliday, publisher of The Indianapolis News, was the chairman of the Indianapolis committee. Sometime during the weeks of Centennial celebration, Mr. Holliday came upon the notion of organizing a society composed of people who were descendants of the early settlers of Indiana, the pioneers who opened the State to civilization, thereafter discussing, promoting and planning it with family, friends and acquaintances. On September 15, 1916, Mr. Holliday and a considerable number of people met to hear the report of a planning committee and its presentation of a proposed constitution that was adopted by those attending. In a subsequent order of business Mr. Holliday was elected the first President, a position he held until his death in 1921. Today, there are four classes of membership available to those persons interested in the goals of the Society: Regular, Junior, Associate and Honorary. More information on becoming a member of The Society of Indiana Pioneers is available on the Join the Society page. Details on the benefits of membership and services available to Society members is on the Benefits page. A list of currently available books and other items are shown on the Publications page. The Society cooperates with the Indiana Historical Society, the Indiana Junior Historical Society, and other historical organizations. Over the years the Society has engaged in various projects. Present membership is about 1,200. From the Society's office at 140 North Senate Avenue in downtown Indianapolis, we strive to serve our membership and continue to celebrate the rich Indiana Pioneer heritage that we share. Hometown and year of term expiration follows each name. This page last updated on Monday, November 12, 2018 . © 2018 The Society of Indiana Pioneers. Design & hosting by Kephart + Associates.